A A dmit it: You like avocados. As in like like. That avocado toast you sacrificed your chances at home ownership for this morning? Yeah, you could’ve left off the toast, and it would’ve been just fine. Same goes for those chips that always show up with bowls of guacamole: they're simply a delivery vehicle. 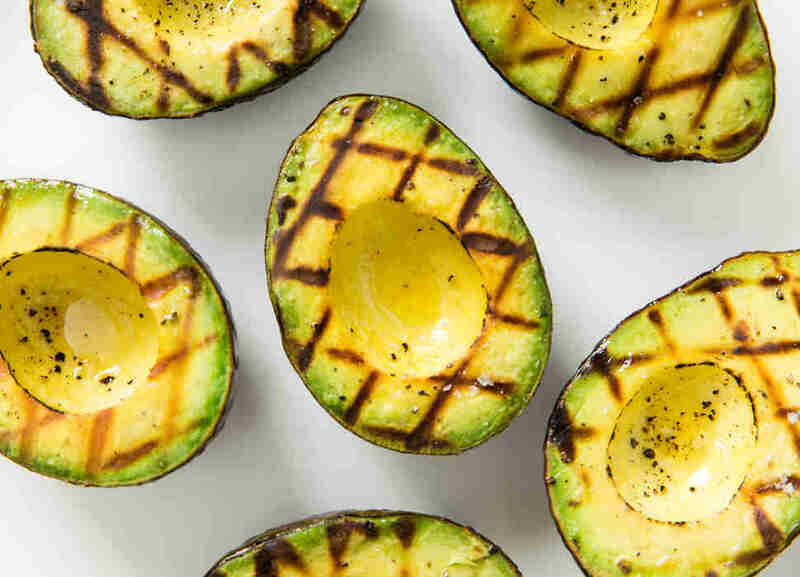 While it might seem impossible to improve upon the creamy green fruit (yes, avocados are fruits), there is one way to magically elevate them to a new taste dimension -- slap them on the grill. Yes, that's right, avocados, like burgers and hot dogs, are a grill's best friend. While grilling an avocado might sound super-simple, follow the guidelines below to achieve perfect results every time. 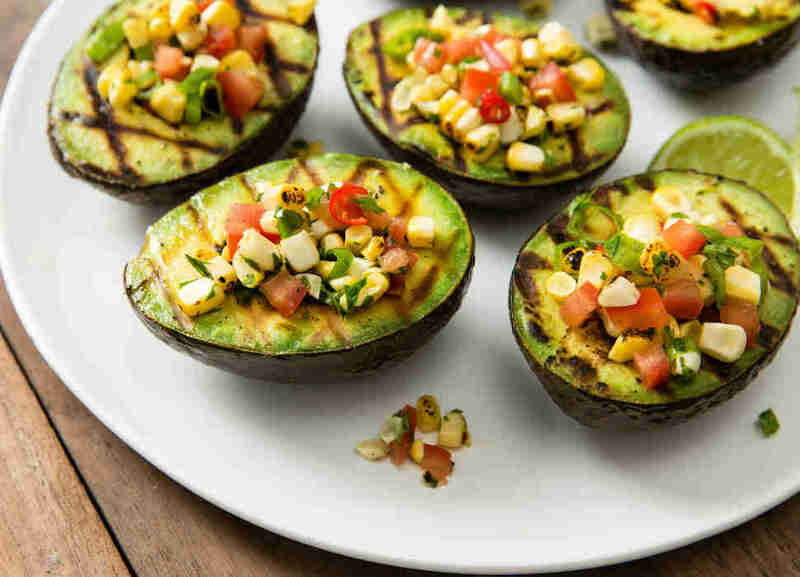 If it’s your first time grilling avocados, stick to this simple mantra: grill, salt, spoon. To accomplish that, fire up the grill (gas will do, but charcoal’s better). Meanwhile, cut the avocado in half and remove the pit, then use a pastry brush or your fingers to coat the cut side lightly with lemon or lime juice and olive oil. This isn’t a time where more is better: too much olive oil and you will end up with a flare up. Sprinkle with kosher salt. Once the grill is at medium heat (too hot and you’ll burn that oil), place the cut side down on the grates. Now wait, letting those grill marks set in. They should take about 3 minutes to cook, Kevin Meehan the chef and owner of LA’s Kali explains. If you’re the impatient type, you can pick up the avocado at the 2-minute mark to see how things are going. It will still probably need a minute or two more. Patience, Grasshopper: You’re looking for grill marks and just a slight char in a few spots. Remove the half from the grill, dress it with more lemon or lime juice, some nice extra virgin olive oil and flakey Maldon salt (yes, it’s worth the $5 a box price tag and it will up your entire summer grilling game). Dive in with a spoon -- nothing else is required! If you’re a spice fiend, take a note from James Beard Award-winning chef Jessica Largey, who likes to top hers with kimchi brine. Or if you're too lazy for that, cut up pieces of kimchi works perfectly well too for a “no fuss snack,” she says. Add a cold beer and your evening is off to a good start. Despite what Bart and Homer Simpson might think, you can win friends with salad -- especially if it’s topped with a grilled avocado. Follow the basic method above, then remove the avocado from its shell and roughly chop it, dropping those chunks on top of an already dressed salad (you don’t want the avo to turn to mush). Top it with a bit more dressing. Ideally, you should go with something acidic or salty like a miso or fish sauce-based dressing. A green goddess with tarragon and dill also works nicely, Price says. “When you think of avocado, you think of cilantro, [but] people are always pleasantly surprised by the fresh dill flavor." If you don't want to make a salad (too many vegetables? 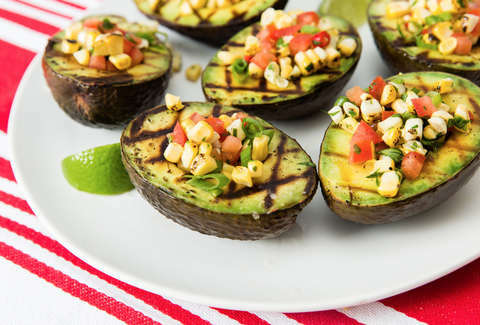 ), remember that grilled avocado halves easily double as party bowls. Fill them up with salsa, esquites (an easy-to-make grilled Mexican corn salad that you’ll want in your summer cooking arsenal), or, like New York chef Julian Medina suggests, a spicy lobster salad. No matter what you fill the avocados with, make sure to have an extra bowl of the stuff on the side so there’s enough for everyone. Avocados play surprisingly well as a vehicle for sweet things. At Kali, Meehan brushes them with avocado honey, which “tends to be a bitter and darker" than the more common clover or orange blossom honey. To temper it, he adds salt and pepper before grilling and brushes the grill with avocado oil so those sweet avocados won’t stick. “The honey burns, so you want to be careful. If you do it right, you can get [the honey to turn] black and that’s cool. It has a different texture, almost that of a candied apple,” he adds. That sweetness, however, needs some acid to balance things out. Meehan takes the two halves out of their shells and sandwiches them around a salad with a citrus vinaigrette, something that’s simple to recreate at home. The honey-laced avocados also work well in a chopped guacamole, or “block guac” as Meehan’s dubbed it. 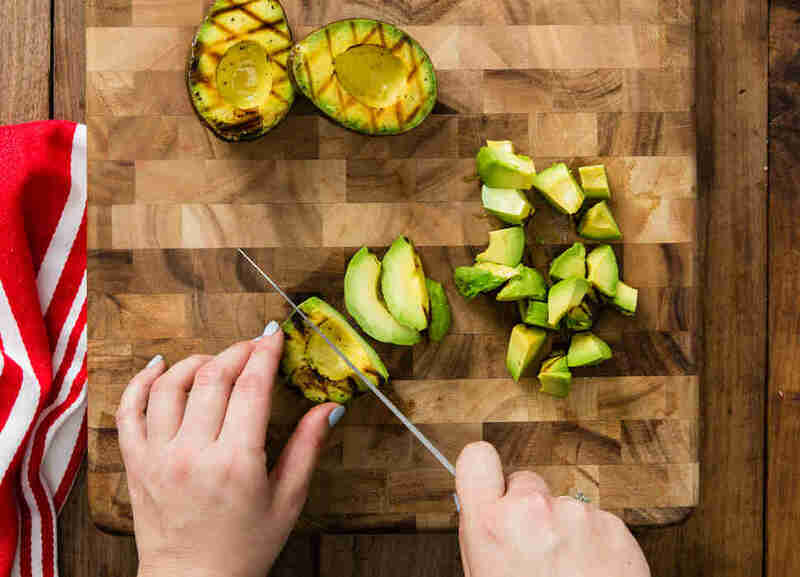 “Take an avocado, brush it with honey, grill, and then scoop it out and chop it -- be careful not to lose the candied outside.” Toss it gently with thin-sliced raw onion, a hot pepper like a jalapeño and “go heavy on lime juice,” he says. If your friends do, feel free to tell them to exit the party. 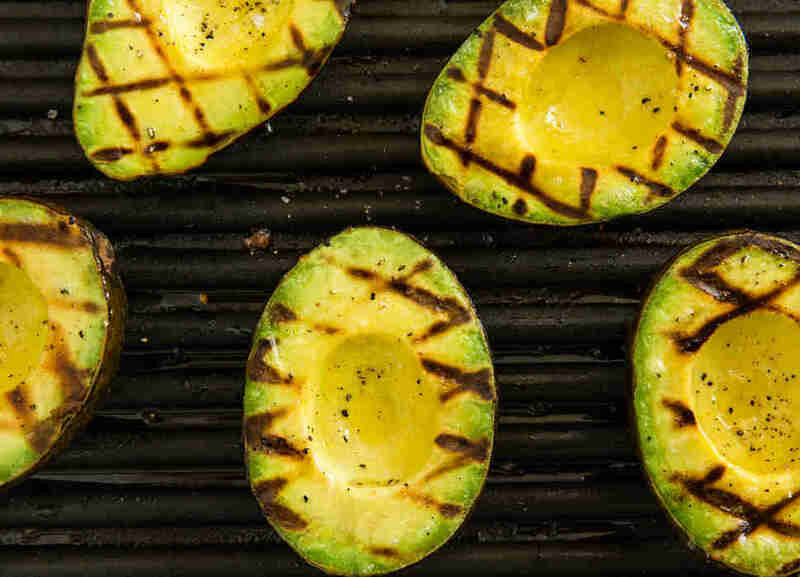 Not everyone has a grill, and while it's tempting to purchase one just to grill avocadoes, that can be a pricey investment. While a broiler will do the trick, you’re best off with a cast iron grill pan for avocados. The oil goes on the avocado, not the pan, Largey points out. But, keep in mind, your stove isn’t as strong as a grill, so “you need to give it time to get hot enough,” she says. Plan to grill an avocado half for 3 minutes, then flip it onto its backside for a minute to make up for the lower temp. You still win. Devra Ferst is a freelance food writer, editor and cooking teacher who can never resist a good avocado (with Crystal hot sauce, please). Follow her adventures @dferst.